Beau Beau and Angie's Fur Days: Where's the Heat? Come here! It is supposed to be 80 today here in southern California. 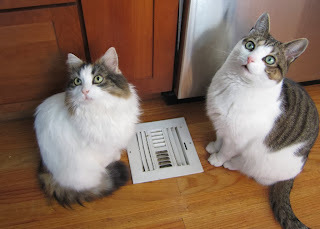 We love the floor heater when it is cool, but today we just get to enjoy sun puddles! I don't like the cold either. When I took my mum for a walk today I nearly turned around and went back home when the cold wind almost blew me over. I hope you get heat! I hate being cold! It's not really cold here yet but I still got the fireplace thingy tonight! Oooh, the lady at your house didn't turn on da heats yet? It IS cold in Connecticat (even down where we live)! Silly kitties, hope the Lady turns the heat on for you. We sure hope you have some heat by now. We came by to wish you a Happy Gotcha Day, Angie. If you can't get heat out of those funny floor spots, just jump onto your pawrents every time they sit down. With luck, they'll catch on, in time. Wow! What a cuties. Both the cats are really pretty.